I have a quick question. I know a consultant who is going to do some work designing a company’s program for high-potential employees. The consultant has talent but not much experience. What hourly rate would you consider low, fair, too high? Can you ballpark this for me? Years of experience in consulting — Consultants just starting out are unproven in the market and can’t charge as much. Type of experience — Where did you learn your craft? Was it at a big firm with formal training (for example Deloitte, Bain & Company) or did you learn on the job as an internal resource with a company? If the latter, was it a company that provided access to training like General Electric, or a small to midsize firm? Independent consultants who come from “name” consulting firms like Accenture or McKinsey often charge more than consultants who come from industry. Similarly, self-employed consultants who worked for a Fortune 100 company can charge more than people who worked for a little-known company. Pedigree matters. Field of expertise — Consultants who can diagnose problems and create sound strategies and actionable plans can charge more than those who focus on more tactical work like project management. For example, organizational effectiveness consultants charge more than change management consultants, and change management consultants charge more than training developers. As a general rule, the more strategic — or frankly, the more mysterious — the work is perceived to be by the client, the more they are willing to pay. Conversely, the more tactical and easier to understand, the less they are willing to pay. Geography — Consultants in New York and San Francisco get paid more than consultants in Cincinnati or Boise, by some estimates up to 25% more. Market conditions and competition — Are there a lot of consultants who do what you do? This is basically the law of supply and demand. This is why Knowing Your Niche is important, so you can stand out from the crowd. Clients are willing to pay more when there is a limited supply. Client’s alternatives — What are the client’s other alternatives? Who else is in contention for the work? If it’s a major firm you can probably get away with charging even more than your normal rate. Nearly always independent consultants are less expensive than those represented by a firm. Generally, the larger the firm the higher their billing rates. Client’s industry — Who is your target market? Government and nonprofits are used to paying much less than corporations. Fortune 500 companies are used to paying more for consulting than start-ups. Typical rates vary by industry too. Companies with large profit margins like biopharma and medical devices are less price sensitive than say the grocery industry, which has thin margins. Professionalism (branding, marketing, positioning) — People who market themselves as an independent professional and who operate as a small business are able to charge more. Confidence — This has a lot to do with what you can charge. 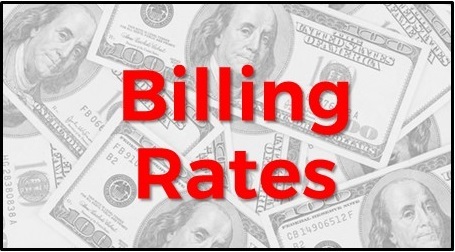 See my earlier blog post, Quote Your Billing Rate with Confidence. Clearly there isn’t an easy answer to Louis’ question, but it's possible for his friend to compute some quick, rough estimates for a reasonable billing rate. There are lots of ways to price your work, including an hourly rate, a fixed price for the whole project, a day rate, a retainer, and even blended rates (for example, a lower rate for working from home than onsite). Most consultants, especially when just starting out, tend to use an hourly rate because it’s the easiest to figure out and there’s less risk of undercharging, especially if the work takes a lot longer than you thought it would. First, identify how much you would be paid if you were a salaried employee at a corporation, including bonuses. Use websites like Salary.com or Indeed.com to get estimates. (Reference: Seven of the Best Salary Information Websites.) I recommend using these sites even if you just left your corporate job because it’s possible you were underpaid. Cost-of-living increases may not have kept up with market salaries. Next, divide by 2,000. This is roughly the number of working hours in a year. Then multiply that number by 2, 2.5, and 3. This will give you a range of billing rates. Important note: this is just a rough idea! The factors listed above, especially the type of consulting you do, will have a big influence on whether these rates are appropriate. The rates may seem high at first, and they’re likely to seem high to your prospective client. This is because as a self-employed consultant you are a business, not just a hired worker. Your billing rate has to cover business insurance, operating expenses (internet, phone, website/email hosting, bookkeeping), and most importantly, self-employment tax (the employer's half of Social Security and Medicare taxes). Your rate also has to cover the non-billable time you spend doing proposals, contracting, invoicing, marketing, business development, and even your vacation time. Knowing your range and your desired target rate within that range is helpful for two reasons. First, it establishes your floor or “walk-away" rate. Knowing this is important so you aren’t tempted to take a project that will be a bad use of your time. Remember, your rate needs to cover your business expenses and unbilled time. Moreover, if you take a project that pays less than your floor rate, your attitude will be affected, which will affect the quality of your work. Second, quoting a range instead of one rate can be a useful negotiation tactic. It leaves room for compromise (that you’ve planned for). For example, I used to tell clients: “My rate ranges from $185 to $225 an hour depending on the scale, complexity, and duration of the work.” A client never offered to pay the low end of the range, nor the top end either. That was OK though because I was aiming for the midpoint anyway. I was happy, and the client believed they were getting a good deal. Bottom line: Do your homework, understand what goes into computing a consulting billing rate, run some numbers, and be confident! If you missed it, I strongly recommend my earlier blog post, Quoting Your Consulting Billing Rate with Confidence, for more useful tips.